US lawmakers have nominated Hong Kong pro-democracy activists - including 21-year-old student leader Joshua Wong - for the Nobel Peace Prize. He was nominated alongside Nathan Law, 24, and Alex Chow, 27, for "peaceful efforts to bring political reform and self-determination to Hong Kong". A dozen members of Congress - both Republicans and Democrats - signed a letter nominating the group. The move from US lawmakers is likely to anger Beijing. Hong Kong, a former British colony, became a special administrative region of China in 1997. It is governed under the principle of "one country, two systems", enjoying a high degree of autonomy. The pro-democracy activists all advocate greater independence or Hong Kong's right to self-determination with varying degrees of radicalism. They became well known after the "umbrella movement" brought parts of central Hong Kong to a standstill for nearly three months in mid-2014. It earned its name from protesters who used umbrellas to shield themselves from tear gas fired by police. "Wong, Law, and Chow and the entire umbrella movement embody the peaceful aspirations of the people of Hong Kong who yearn to see their autonomies and way of life protected and their democratic aspirations fulfilled," the US nomination letter said. Senator Marco Rubio and Representative Chris Smith - the Republican chair and co-chair of the Congressional-Executive Commission on China - were among the signatories. "This nomination could not be more timely as Hong Kong's long-cherished autonomy continues to erode," Mr Rubio wrote. Mr Smith said the activists were following in the tradition of former peace prize winners, and "hold up a mirror to the ugly face of authoritarianism". In mid-January, Mr Wong received a three-month prison sentence related to the protests. He had been on bail pending an appeal against a separate six-month term, and both sentences are now under appeal. 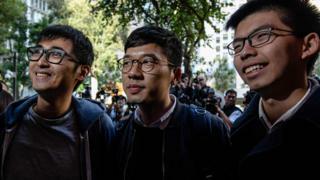 Nathan Law and Alex Chow were also handed sentences - and all three were banned from political office. Mr Law had won a seat in Hong Kong's Legislative Council in the 2016 elections under his and Mr Wong's new Demosisto Party, becoming the youngest lawmaker in Hong Kong at 23. However he was later disqualified from office along with other pro-democracy activists who protested against Beijing while swearing in to the council. Mr Wong told Reuters news agency he hoped the peace prize nomination would give his group more power to strike a deal with the mainland government. "I believe the nomination would show the international community and [Chinese President] Xi Jinping how the young generation will persist in fighting for democracy, even if we have to face imprisonment or a permanent ban from public office," he said. Is this proof Hong Kong’s 'Umbrella Protests' failed?